The refreshing and warming flavors of winter have inspired this special collection. Brown Butter Marzipan: A layer of Amaretto infused marzipan topped with white chocolate brown butter ganache in a white shell. Peppermint: Peppermint & white chocolate ganache with bits of organic peppermint all coated with dark chocolate. Hot Buttered Rum: A white chocolate ganache infused with hot buttered rum batter and a touch of rum, surrounded by milk chocolate. 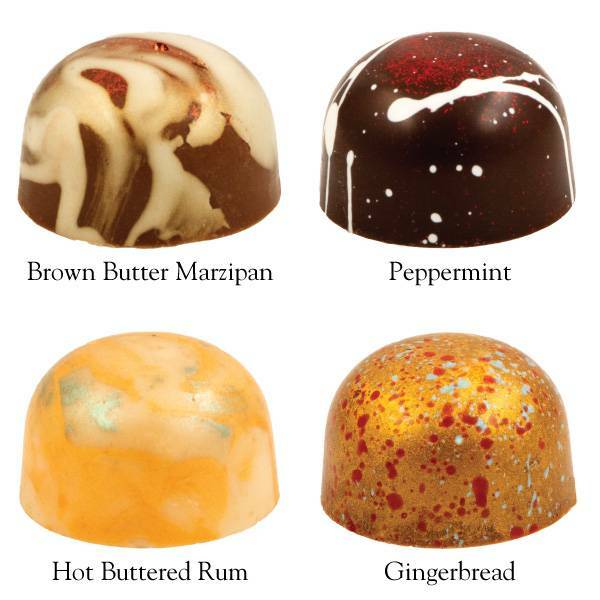 Gingerbread: A milk chocolate ganache infused with fresh ginger and warm spices, in milk chocolate. Only available for the Winter of 2018/19, so don't miss them! 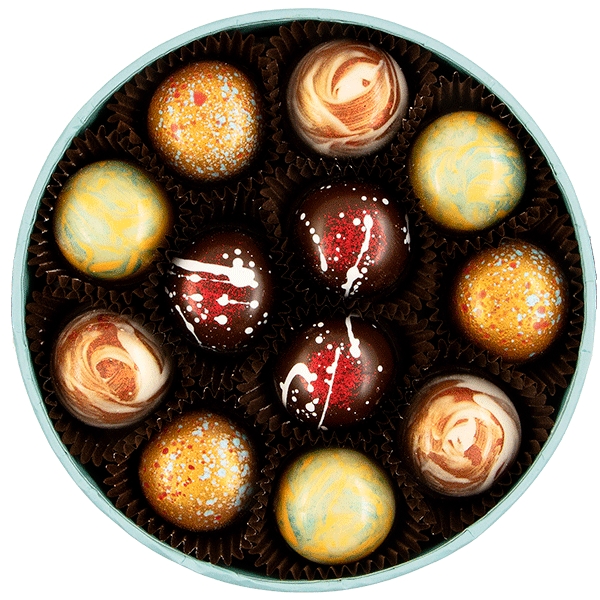 All our filled chocolates are best if consumed within 14 days of delivery. INGREDIENTS: SUGAR, UNSWEETENED CHOCOLATE, COCOA FAT, DRY WHOLE MILK, FULL CREAM MILK, SOY LECITHIN ADDED AS EMULSIFIER, NATURAL VANILLA FLAVOR, ARTIFICIAL COLOR.